ALL TICKETS HAVE NOW SOLD OUT - Only RE:SELL Tickets will appear if they become available so please join the waiting list. 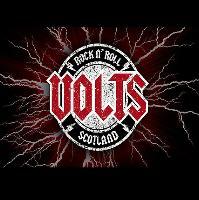 Volts truly is THE band for the party-hard and the die-hard alike. TICKETS £10 in advance - Don't expect any on the night - This gig sold out three weeks in advance last year !! IF YOU ARE COMING - GET A TICKET IN ADVANCE. On Sale online Jan 2018 - Printed Tickets at Mid Street Barbers / Kilt Studio / West Lothian Guitar Services and our Paybooth Early 2018. TICKET ALSO includes entry to the Rock Club after the live show till 3am as well.